We supply many different brands of round and rectangle trampoline mats. However, with so many different brands and sizes, it can be difficult to know which mat will best fit your trampoline frame. It helps to have a spring count and accurate measurement of your mat, which can be tricky if the mat is torn. Please see the information below, and contact us for guidance if you need help. Count the number of spring locations along the long side… then the short side. Eg 17 + 10. This identifies the Brand and Model. See below where to measure from. 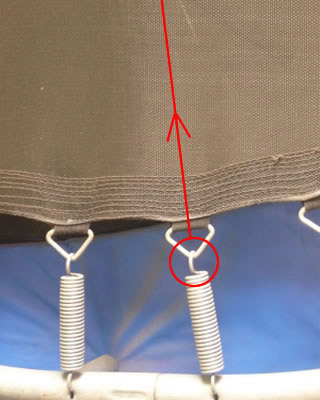 Either tip of triangle, or Inner edge of Mat Hole (even if hole is torn outward). Our rectangular mats are all made for the wire bar system (photo on right). This is an Aussie-made mat. You can re-use old wires if you have them. 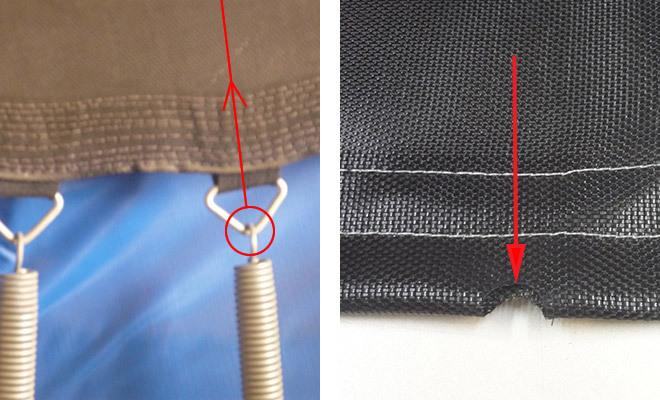 However, if your old mat has the trangle attachments (Chinese-made mat, photo on left), don’t worry – our mats will still fit your frame, but you’ll need to buy our mat with wires. Important: Your old mat measurement needs to be within 2cm of ours, otherwise the mat WON’T FIT! Important: We don’t offer returns or refunds on round replacement mats, so it’s important that you get the correct one!